Amish, who is the famous writer of the Shiva trilogy now announced the availability of the Second book of his Ram Chandra series named “Sita – Warrior of Mithila”. The book will be released on May 29th, 2017. It is available for Preorder from Amazon India. Like the Shiva Trilogy (The Immortals of Meluha (2010) ,The Secret of the Nagas (2011) ,The Oath of the Vayuputras (2013)) the Ramachandra series also will have 3 books in which the first book, Scion of Ikshvaku was published in 2015, and the Second book “Sita – Warrior of Mithila” in 2017 and third book “Ravan – the orphan of Aryavarta” will be plublished later. Second and third books will be the continuation of the first book, and normally first and second books end in a situation where readers will be anxious about what will happen next. If you pre-order the second book you will get a Free booklet for a sneak preview of the third book. The first 4 books of Amish have sold over 3.5 million copies in the Indian subcontinent since 2010, with gross retail sales of Rs. 100 crores. 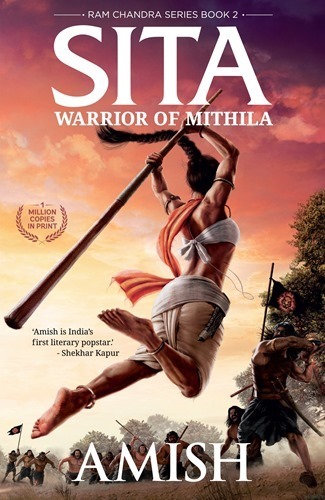 After the Shiva Trilogy & the Scion of Ikshvaku (Book 1 of the Ram Chandra Series), comes my new book Sita- Warrior of Mithila, which is releasing on the 29th of May 2017. This is my 5th book and the second book in the Ram Chandra Series. Sita – Warrior of Mithila, is inspired from the Adbhut Ramayana, and is the unheard story of Lady Sita. In this book, readers can follow Lady Sita's journey, from the life of an adopted child to that of a warrior Prime Minister and finally a Goddess. The story will feature all the familiar characters from the Ramayana, like Lord Ram, Lord Lakshman, and many others from the kingdom of Mithila. In the book, you will also discover the true purpose of the Vayuputras and Malayaputras and how their conflicting ideologies lead to plot twists, politics, and intrigue as they try to influence outcomes from behind the scenes. I want to thank you for your love and support for all my books. I hope you enjoy reading Sita- Warrior of Mithila. I look forward to hearing your feedback on it. Grab 22 programing eBooks one per day.